A new Cold War between the US and China isn’t inevitable. But better inter-military communication will be needed to stop one, says Michael Swaine. 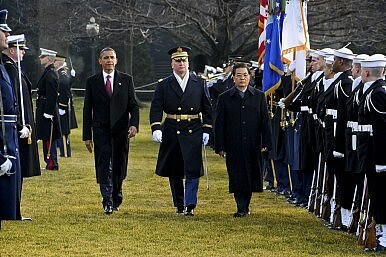 Despite the mostly friendly nature of President Hu Jintao’s state visit to Washington last month, the potential still exists for the US-China relationship to become much more adversarial, especially in the military-security arena. A combination of deepening strategic distrust (found most notably within the militaries of the two countries), China’s steady acquisition of maritime power projection capabilities, the persistence of bilateral tensions associated with territorial issues along China’s maritime periphery, and a growing sense in China of the United States’ economic decline could prod both countries to view Asia as a zero-sum game and look for ways to counter each other’s military actions. If this is to be prevented, the two countries will need to start considering more long-range, strategic communication. Since the 1990s, China has increased its military spending by an average of more than 10 percent per year as it seeks to modernize its defence forces. Beijing now has close to 50 modern diesel submarines, and is developing a new class of nuclear submarine. China also has new short-, intermediate-, and long-range ballistic missiles—both conventional and nuclear—while its medium-range missiles can already reach many parts of Asia, including Japan and several US airbases. As a result, China’s growing capabilities and its ability to reach beyond its borders are causing concern not just within the Asia-Pacific region, but in the West as well. China’s neighbours—notably Japan and Southeast Asian nations—are worrying about how they might counter China’s growing ability to regularly deploy forces in the region, and are concerned that China will directly confront other countries over territorial and resource issues in the South China Sea and East China Sea. In response, Japan is shifting the deployment of its military southward, while Southeast Asian nations are acquiring greater offshore capabilities. They are also looking to the United States—as the region’s dominant military power—to provide a counterbalance to China’s growing power. And Washington isn’t sitting idle. It is deploying more forces to Guam, reaching a better understanding with Japan about the use of force during crises, increasing surveillance and patrolling along China’s coast, selling more arms to Taiwan to deter Beijing from using coercive means, and engaging in classified efforts to counter China’s missile threat to US warships. But as the two militaries grow more suspicious of one another, they are driving the competitive and adversarial dimensions of the overall bilateral relationship. The concern is that perceptions on both sides—Washington can increasingly see a more assertive and aggressive China, and Beijing a United States in a prolonged period of decline—will fuel the feeling of strategic rivalry. The assumption that military competition will ultimately lead to a Cold-War type situation is the biggest threat to stability. But there are things Washington and Beijing can do to avoid this outcome. First, the two countries must engage in a strategic dialogue at the track-two—or semi-official—level with military and civilian figures outside government. By holding open-ended talks that go beyond the official level, these participants can address the medium- and long-term implications of the current military trajectories and the specific territorial, economic, and political issues driving the countries apart. While leaders won’t officially be involved in the discussions, track-two participants should maintain close contact with them to keep them informed of developments and seek their input. Second, both sides must sustain and strengthen military-to-military links, as US Defence Secretary Robert Gates signalled during his recent visit to China. These ties must be insulated from the overall ups and downs of the bilateral relationship, to avoid feeding mistrust and curtailing understanding between the militaries. Third, Washington and Beijing need to assess the military dynamic over Taiwan. China’s military continues to deploy forces along the coast, while the United States continues to sell arms to the island. As time goes on, China will be less likely to tolerate US military aid to Taiwan. Washington should therefore reconsider its current strategy and contemplate broaching a conversation with China about mutual constraint. Fourth, both militaries should expand ways of cooperating on other security issues. China is already participating in international piracy controls in the Gulf of Aden. Further cooperation in areas such as disaster and humanitarian relief, counterterrorism, or other non-traditional threats would help boost the overall relationship. All of these steps will involve strengthening the incentives and abilities of both militaries to cooperate, while avoiding the use of worst-case assumptions about the other. It won’t be easy—both militaries will need to make a sustained commitment to communicate frequently, at both the personal and operational levels, and with as much candour as possible. This in turn will require a strong commitment to such military contact on the part of senior civilian leaders on both sides. Unless this happens, however, progress on strategic issues will be limited, hostility could grow, and both sides could become more resolute about defending their respective military objectives. Michael Swaine is a senior associate at the Carnegie Endowment for International Peace. Beijing’s submarine fleet is not as big or powerful as US military planners once feared. Have its blue-water ambitions been overstated?